I use these flowers all the time to decorate bags, cards, hats, and make brooches. It’s actually an extension of this double layer petal flower pattern, which can be made into a square for blankets etc. Personally I think an odd number of petals looks nicer, so I have modified the pattern to make 7 petals around instead. Starting with the middle colour, make a magic ring. I like the tutorial on Planet June if you don’t know how to do this! Round 1: Ch4 (counts as 1 dc, 1ch), *dc into magic circle, ch 1, repeat from * 5 more times, join into 3rd chain of the initial chain 4 with a slip stitch (7 chain spaces). 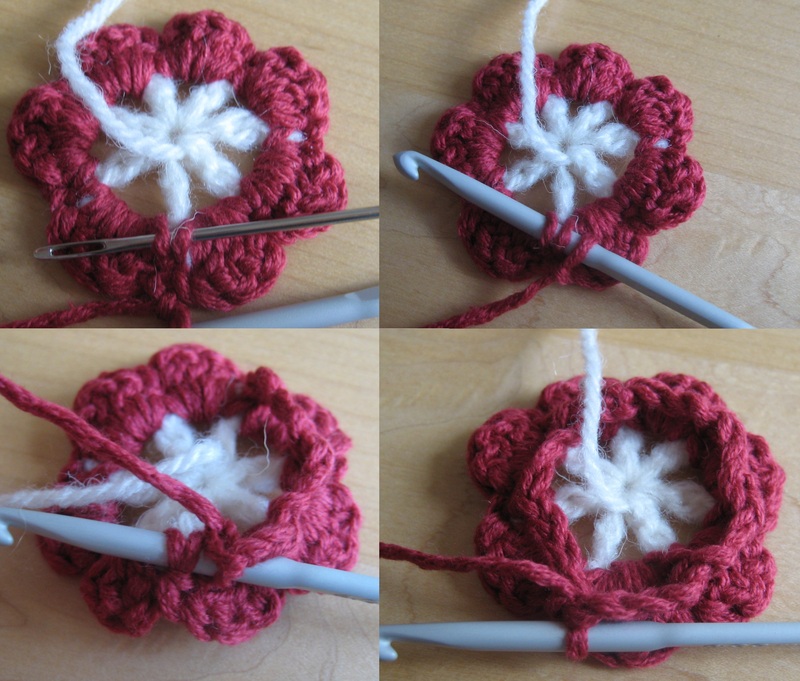 Round 2: Ch1, *sc, 3dc, sc into chain space, repeat from * 6 more times (7 petals made), join with a slip stich into first sc. Round 3 is worked behind the petals just made to make chain spaces for the next round of petals. Round 3: Ch1, sc into the sc stem of the last and first sc of round 2 (see picture), *ch 3, sc into next pair of sc stems, repeat from *around and finish with a ch3 and join to the first sc with a slip stitch (7ch spaces behind petals made). Round 3: 1st: Needle shows which are the sc “stems” to put the first sc into. 2nd: Hook inserted. 3rd: about to complete 3rd ch space with a sc. 4th: Round 3 complete. Round 4: ch1, (1sc, 5dc, 1sc) into each chain space around (2 layers of petals made), join into 1st sc with a slip stitch. Round 5 is similar to round 3. Round 5: Ch1, sc into the sc stem of the last and first sc of round 4 (see picture), *ch 4, sc into next pair of sc stems, repeat from *around and finish with a ch4 and join to the first sc with a slip stitch (7ch spaces behind petals made). Round 6: ch1, (1hdc, 2dc, 3trc, 2dc, 1hdc) into each chain space around (3 layers of petals made), join into 1st hdc with a slip stitch. 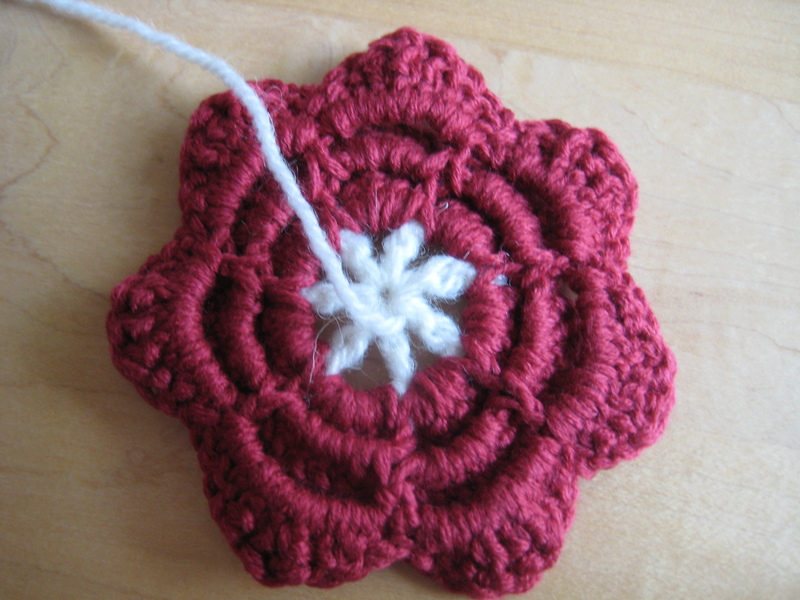 You can make this pattern and stop after round 2 or 4 for a smaller flower, or try changing colours in between each round of petals for a more colourful look. Making a 6 or 8 petal version also works, just adjust the number of ch spaces in round 1 accordingly. Very pretty flowers, these are perfect for bag/hat decorations -thanks for sharing the pattern. Thank you for the pattern! I’ve made one, and it turned out big, so I’m wondering if you’re using American or English terminology? Thanks. I love these!! Thank you so much. Can you tell me where to find the pattern/or how to make them into a “blanket”.. I would like to make one for my mom. Would I just crochet a afghan (I’m thinking a spring green) then attach them all over it? I want it to look likes blanket of flowers. 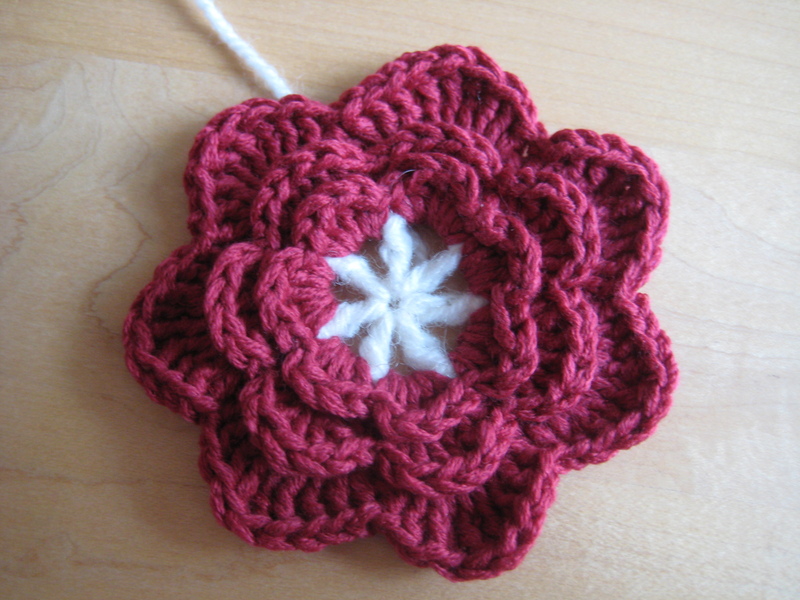 Yes I agree that it is a beautiful flower and easy to crochet. Thank you .